Fish ‘n ski boats are a genre all their own, but truth be told, virtually any outboard powered fishing boat can be turned into a fish ‘n ski. You can quickly expand the use of your boat with one small addition: the TurboSwing. Sure, you could use that center console for fishing, but why not expand its use? Surprisingly, it’s easier than it sounds to complete this transformation. In today’s age of innovation, consumers want products that can do it all. Think about smartphones – you get a phone, a computer, a camera, a wallet, and so much more. Now, let’s apply the same concept to boats. Fish ‘n ski models combine two of America’s favorite pastimes: fishing and water skiing, or in many cases, all watersports including wakeboarding, wakesurfing, or kneeboarding. Because fish ‘n ski boats look to accomplish very different tasks, they’re often built with some adaptable features. These watercrafts typically have ample seating and provide a comfortable ride. Meanwhile, their lounging areas and sunpads can easily serve a dual purpose as casting platforms, often thanks to removable cushions. Removing those cushions prior to fishing also helps to protect your vinyl and make for a quick cleanup after a long day of reeling in your catch. Although a fishing boat may have fewer seats, the only critical thing they need to become useable for watersports is a tow point. 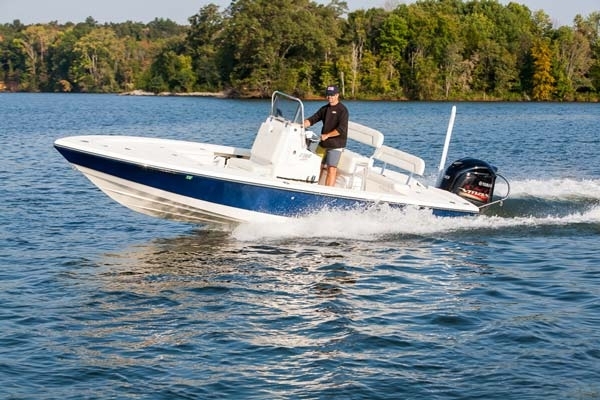 In terms of one extra feature that can help enhance any center console to the point that it’s really a fish ‘n ski boat, TurboSwing fits the bill. It happens to be easy to install and effective to use. 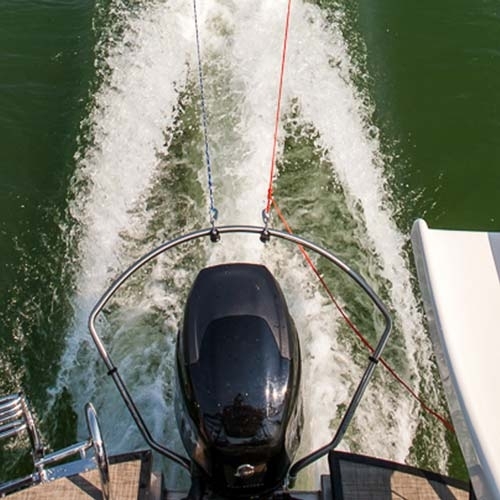 Capable of attaching to almost any style outboard engine motor mount, its basic yet versatile tow bar design fits safely onto the transom – unlike ski pylons or wakeboarding towers, which take up room in the back of the boat, a TurboSwing saves valuable space onboard. Tubing from a Fishing Boat? Serious anglers may shake their heads at the thought of a fish ‘n ski boat—you might even ask, “Why would anyone ever want to go tubing, skiing, or wakeboarding behind my beloved fishing machine?” While the fisherman inside of you might scoff at the idea, your friends and family members surrounding you might jump at the thought. Your boat should be thought of as a multipurpose investment. Sure, some weekends might be spent working towards the catch of the day, but others might be spent teaching your kids how to water ski or pulling them around on a tow-toy. That’s the beauty of pulling tubes from a bass boat. 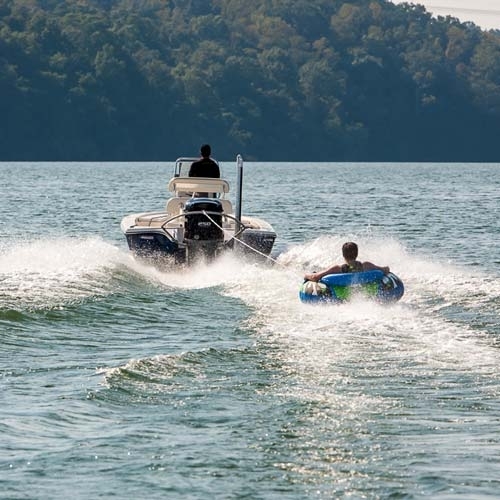 With TurboSwing attached to the transom, you’ll have the ability to do all this and more. You’ll still be able to tilt your engine up to get into skinny waters and find the best fishing spot. But with a TurboSwing installed when your crew starts to get antsy, you can break out your tubes, skis, or boards and hit the wakes. Plus, TurboSwing is the only tube-rated tow bar on the market — so riders are in for an optimum tubing experience, including pulling multiple tubes. 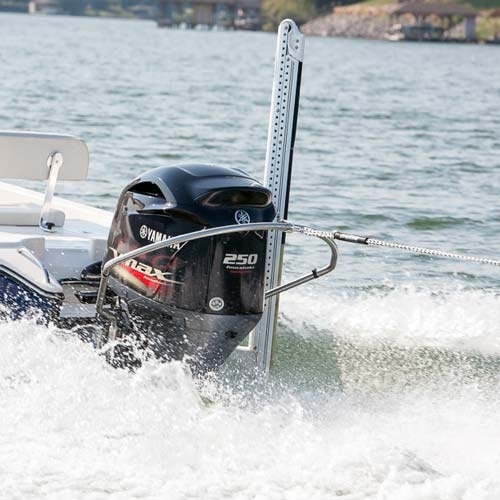 Outboard motors are typically synonymous with fish ‘n ski or bass boat models. Because they hang off the back of the boat, outboards create additional room in the cockpit. They also allow for extra storage space by positioning the engine aft. That extra space is always useful, whether you’re fishing or towing passengers in the wake for some watersports action. But another big advantage of any outboard-powered boat is the ability of the engine to be fully lifted, or “trimmed,” out of the water. This is particularly nice for anglers using a trolling motor to get into shallow waters, but we’ll touch more on that later. What’s important for you to know right now is that the TurboSwing is designed to leave the engine’s range of motion completely unaffected – and as a result the trimming functionality remains unaffected. TurboSwing is an ideal solution for bass boats or fish ‘n ski models because it satisfies the boat’s dual personalities. With quick release clips, you’re able to remove the entire bar in a matter of seconds. The clips also make transitioning from fishing to watersports fast and efficient. Installation is simple and the instructions are straightforward, allowing you to spend more time focusing on what’s important: fishing and skiing. Its pulley system also assists in making life easier for watersports junkies. The pulleys enable multiple riders to be pulled at once, allowing the rope to swing sideways in either direction to improve the rider’s angle and reduce jerks on the tow rope. Thanks to this, many drivers even notice improvement in the boat’s handling. Jack Plates, Power-Poles, Kicker, or Trolling Motors? Speaking of handling, all anglers understand the value of having total control over the boat at all times. Even on a fish ‘n ski, it’s extremely important to be able to move effortlessly from spot to spot, and ultimately put more fish in the boat. This is where Power-Poles, kickers, and trolling motors come into play. 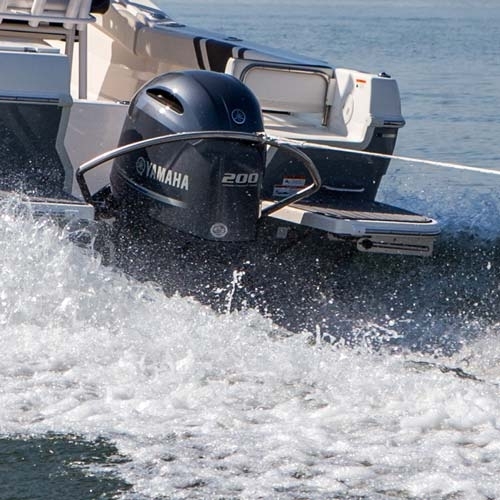 These motors can be positioned either in the bow or the transom of most boats, while Power-Poles are located on the transom. In most cases, the TurboSwing can accommodate them – without affecting their performance. The TurboSwing’s benefits for anglers are obvious, as well as its benefits for the other half of the fish ‘n ski concept. When it comes to watersports, the placement and angle of TurboSwing helps to keep the tow rope elevated and out of the water. But this same idea also serves as a solution to a common issue for many anglers: finding your line tangled up in your prop. Luckily, the TurboSwing not only acts as a protective barrier around your motor, but also helps keep fishing line away from it. The fish n’ ski boat concept has always been an idea driven by innovation. TurboSwing takes this to the next level, and allows for even more flexibility onboard a multipurpose boat.